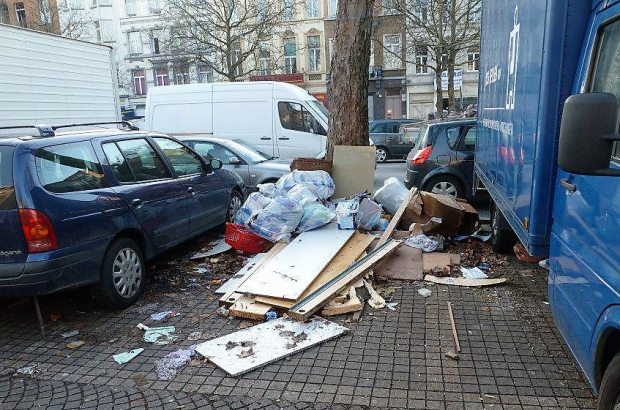 Belgian cities are apparently shaping up when it comes to trash in the streets. Except Brussels. That’s the result of a study carried out by consumer rights organisation Test Achats this month, when it compared litter, dumping and graffiti in 44 Belgian cities with results from six years ago. The researchers chose the four most populous municipalities in every province and in Brussels. The study also took into account cigarette ends, overflowing rubbish bins and dog mess. In general, the cities performed better this time around. Eighteen of the 44 in fact were super tidy, earning a maximum score of five on Test Achats' scale. That’s much better than in 2012, when only three cities earned the maximum score. Brussels, however, was one big exception, with three of the four municipalities earning a two, the lowest scores on the whole list. “While in other cities rubbish and a general dirtiness tends to be limited to certain neighbourhoods, in Anderlecht, Molenbeek and Schaerbeek, it’s a municipal-wide problem,” said Test-Achats in a statement. Those three municipalities got two out of five, while Brussels-City got three out of five. Saint-Gilles was not included in the study, but Test Achats has an office there and said that staff are continually amazed at the amount of trash they see in the street on a Monday morning. One solution for some of the litter, according to Test Achats, would be to apply deposits to plastic bottles and drink cans. Some of the cleanest cities in Belgium, by the way, are Leuven, Mechelen, Halle and Waterloo. Those that need some work (outside of Brussels) are Mons, Charleroi and Namur. It’s management, not money. Come on Mayor Close, you can do better. I agree with Leonard, this is ridiculous and unacceptable. The next person to run for mayor should run on a campaign of "Make Brussels Beautiful Again." Seems to follow the same trend as dog mess... Walloon cities and Brussels remain the worst whilst the Flemish cities (and Waterloo - hardly representative) are cleanest. What seems to be required is a combination of the mayors of these municipalities spending their money in appropriate ways, alongside educating the population to show more pride in their and dealing with people who litter, fly-tip and let their dogs go where-ever they like much more severely.